You don't need a campfire to make a Smore, and you certainly don't need to be a child to enjoy eating one. A Smore (or S'more) takes roasted marshmallows and pieces of chocolate and sandwiches them between two graham crackers. Credit for inventing this sweet and gooey snack goes to the Girl Scouts of America who included a recipe in their 1927 Girl Scout Handbook. The name "S'more" comes from their tasting so good that after eating one, people were said to ask for "some more". In the States we honor the Smore by celebrating "National S'more Day" on August 10 (although it's not an official holiday). Now eating a Smore can be messy business, which makes it perfect food for eating outside around a campfire. For eating at home, however, we need a more practical Smore, one that can be easily made in our kitchens. The answer is a Smore bar (or square). This dessert still uses graham crackers, marshmallows and chocolate only in a slightly different way. The graham crackers are going to be in crumb form and mixed with melted butter. Sound familiar? Yes, we are making a graham cracker crust and it is pressed into a baking pan and baked until golden and set. Then we top the baked crust with miniature marshmallows and chocolate chips (or chunks) and pop it back into the oven until the chocolate starts to melt and the marshmallows become all soft and golden. 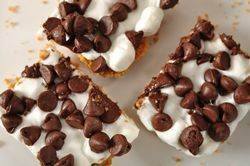 Unlike a Smore that is eaten straight away, these squares need to be cooled completely before removing them from the pan and cutting into squares. They are wonderfully soft and gooey and sweet with the flavors of graham crackers, chocolate, and caramelized marshmallows. I like to think of them as my homemade candy bar. Of course, store bought miniature marshmallows are perfectly acceptable in these Smores especially when you are short on time. However, using homemade marshmallows (recipe here) in these bars will take them to a whole different level. If you plan ahead the marshmallows can be made up to two weeks in advance and since you won't need the whole batch, there will still be some marshmallows leftover for making hot chocolate (recipe here) or Rice Krispies Treats (recipe here). If you use homemade marshmallows in these bars you will notice that they will lose their shape and become a solid layer of melted marshmallow. Store bought marshmallows, on the other hand, while becoming soft and caramelized, do tend to keep their shape when baked. Note: If you live in a country where graham crackers are unavailable, use crushed Digestive Biscuits. S'Mores: Preheat oven to 350 degrees F (180 degrees C) and place the oven rack in the center of the oven. Line the bottom and sides of an 8 x 8 inch (23 x 23 cm) square baking pan with aluminum foil. Stir together the graham cracker crumbs and the sugar. Add the melted butter and stir until all the crumbs are moistened. Press this mixture firmly onto the bottom of the prepared pan and bake in preheated oven about 10 minutes, or just until the crust begins to turn golden brown. Remove from oven and evenly sprinkle with the chocolate chips and marshmallows. Return to oven and bake for another 10 minutes, or until the marshmallows are soft, lightly golden, and starting to meld together. Remove from oven and place on a wire rack to cool completely. Once cooled, lift the squares from the pan by holding the edges of the foil. With a long sharp knife, cut into squares. Can be stored at room temperature for several days.